By design, I had intended to write all week long and then clear out of non-fictiony and bloggery land for the weekend. But I’ve found that on Monday my mind is saturating out with the – did that really happens? – and questions of how to tell it: photographs or videos or just words un-formatted, un-punctuated, without swank or declaratives. So I fear it will probably take until Tuesdays for recaps. My apologies, Internet. I’ll send you a partial refund. 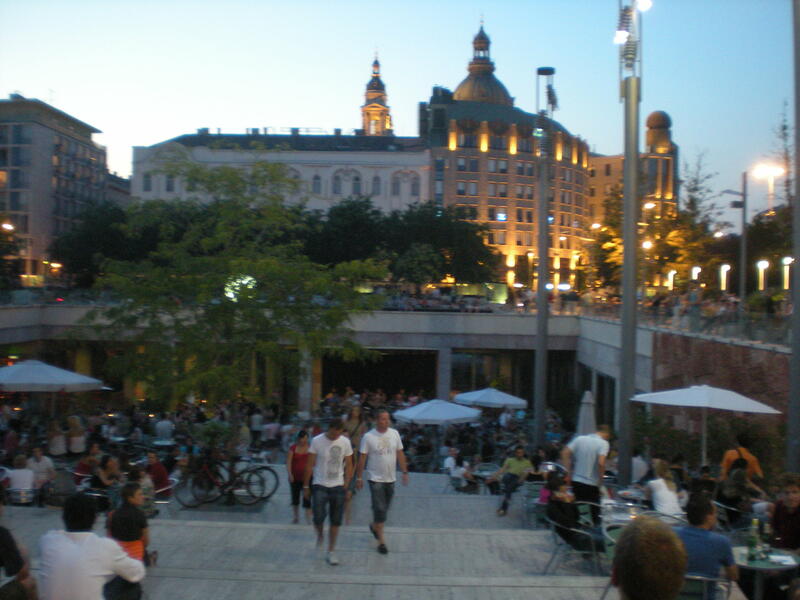 As I wrote, the F1 weekend (along with its celebrity drivers and intoxicated fans) was quickly descending on Budapest. By Friday, the hysteria was in full swing, and admittedly a little bit exciting. Györgyi and her colleagues work for Big Evil American Oil, of which two of the many luxuries are both tickets to the entire F1 weekend (and seats in the Paddock Club) AND being able to stay in an all-expense paid five star hotel when some of the American bosses decide at the last minute not to come into town for the long weekend. And one of the benefits of friendship—I was able to tag along for the sweet decadant ride. On Friday night, after checking in and taking a few minutes to remember what air conditioning felt like, we walked down and out of the hotel where we were met by a few hundred barricaded fans snapping pictures of everyone who came through the rotating doors in the event it was a driver or other celebrity. And actually, as we all walked out of the lobby, I suddenly felt really proud of myself for absolutely no rational reason. But I recommend it. Even if it’s just your husband or child or partner or whoever. Have them wait just outside of your garage or front door in the morning with a camera when you are leaving for work. A light pound on your car window and a –look here!—over here!— (among lake of flashes) will really do wonders for your day. So, even though we were right on the main pedestrian shopping row, Váci utca, we ended up enjoying a slow evening walk, a light dinner, and visit to the local non-stop convenience store for a few beers, sparkling waters, and ice cream cones, which we enjoyed on a park bench across from the hotel. The sun was all but retired, but people were still laying in the grass on blankets, walking their dogs, skateboarding, gossiping, enjoying the pleasant, summer night. Another interesting feature of this city is the outdoor beergarden atmosphere. 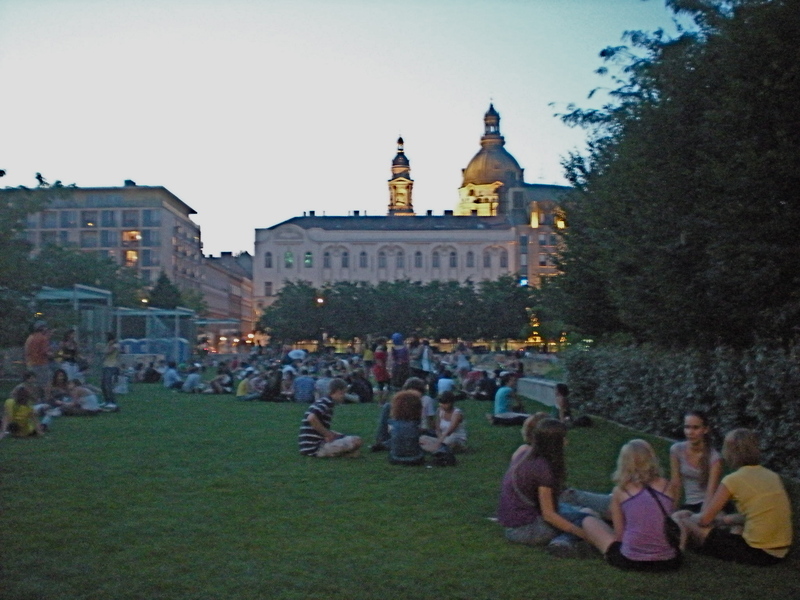 In almost every district it seems like you stumble upon a big public park or gathering place, where there is also a stand which serves Hungarian beers, wine (glass or bottle), and some liquors like Jägermeister and pálinka. Then you can take your drinks to the surrounding area (and even though it’s not uncommon to see people on any random street bench having a beer, I don’t think it’s encouraged.) I’m not sure if public drunkenness or underage drinking is a problem here, something I’ll look into in the future, but the majority of the people seem relatively well behaved. Then again, if you’ve ever been to a Cleveland Browns game in the middle of December and witnessed that public debauchery, your sense of relativity is probably somewhat skewed. So, as not to waste time without the goosedown covering in the nearly chilly rooms, we headed back to the hotel early, past the camera-poised crowd at the backdoor, and turned in for the night. Saturday kicked off with the first breakfast since being in Hungary where I had to remember the correct posture for holding a melon spoon. I didn’t take a picture of the buffet, but it would be cruel to show it to you anyway. But there were the usual standards, followed by what seemed to be an entire room of fresh fruits, Hungarian meats, French cheese, and homemade raspberry jam-filled donuts rolled in granulated sugar. For a few minutes, while enjoying my American coffee, I plotted what I believed to be a serious strategy for filling my purse with donuts. Unfortunately, we were seated outside next to a very polite French couple, and I was worried that the young woman in her Louis Vuitton skirt would have collapsed in disgust on the terrace if she saw me do it. So I only took a handful. Okay I didn’t, but I almost did. After breakfast we finally went to Vásárcsarnok in the Fővám tér. 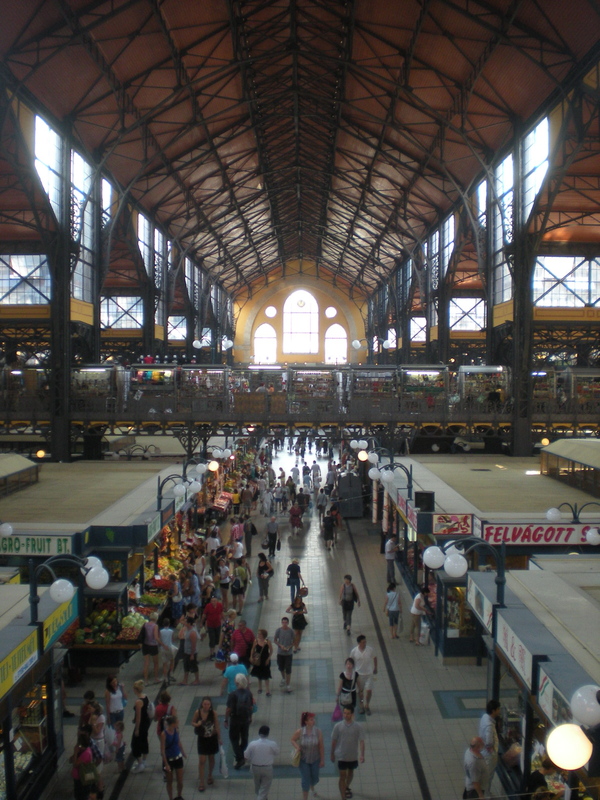 Every experienced traveler will tell you that as soon as you get to a new place, go to the central market, preferably as soon as you drop off your bags at the hotel or put your book bag in a locker at the train station. It is where the city is at its most honest. Where locals buy and sell. 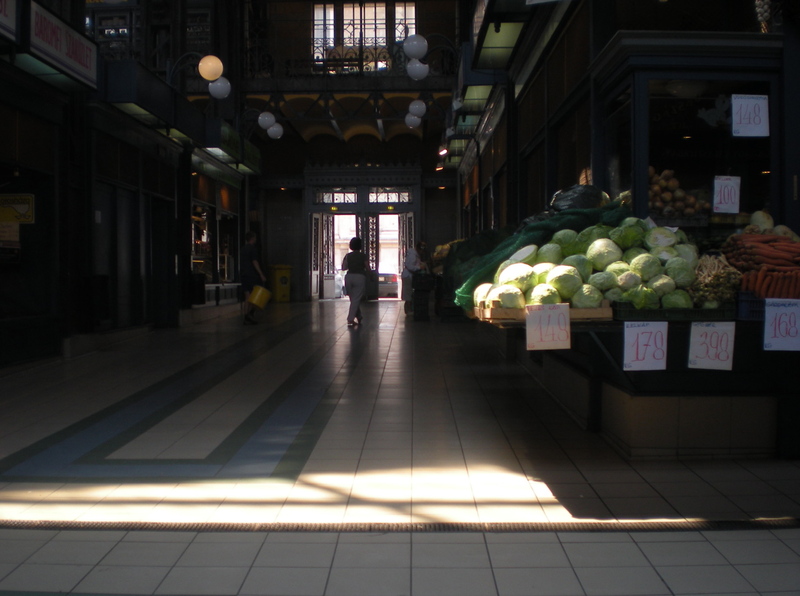 Where they read the paper, drink espresso, and barter for cheap, fresh foods. And from its fruit vendors to fish mongers, this market was truly amazing. 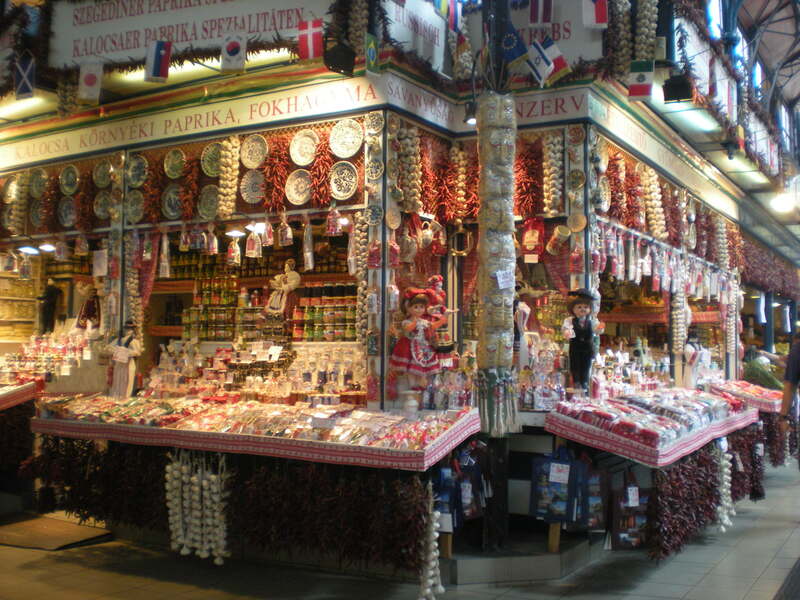 Row upon row of Pick salamis and sausages, every imaginable pálinka and Tokaji, dried paprika and garlic hanging in curtains. The vegetables still smelled like the soil and the stairs to all three floors were a wooden and foot-worn. And on the top floor, folk artists were selling their wares: porcelains, laces, paintings, scarves. I can say confidently that it is place (built in the late 19th century by architect Samu Petz) is an absolutely essential stop for anyone visiting Budapest. On the opposite end of the top floor, there were food and drink stalls, which were just starting to busy with the lunch-hungry crowd. 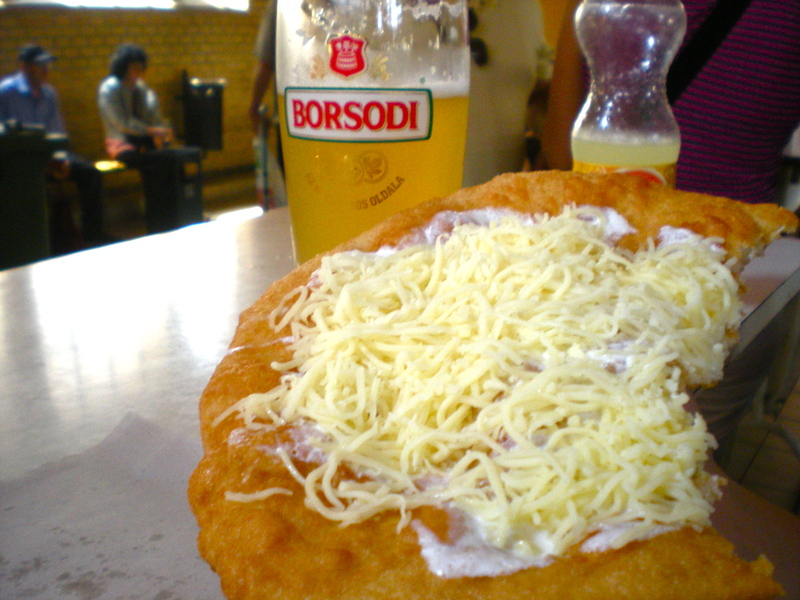 And even though we had only just stuffed ourselves with breakfast a few hours before, we couldn’t resist sharing a quintessential Hungarian snack, lángos, which is basically fried dough topped with sour cream and shredded Hungarian cheese. And Borostyán sör to wet our whistles. I loved the travelogue of the weekend. It made me want to be there, AGAIN. I wish I knew how to make them. Why don’t you ask her? And it shouldn’t bother you that you focus on the food. Most people do. It’s one of the central points of any culture. And you grew up with a sense of national heritage BECAUSE of the food. Hungarians, as you know, are a quite proud people, and especially proud of their national dishes. So I’m very glad that you focus on it!! !